Choose from five different types of accommodation in Wainui Bay. All offer a natural bush environment and private location that invites a feeling of escape from the hustle of daily life. 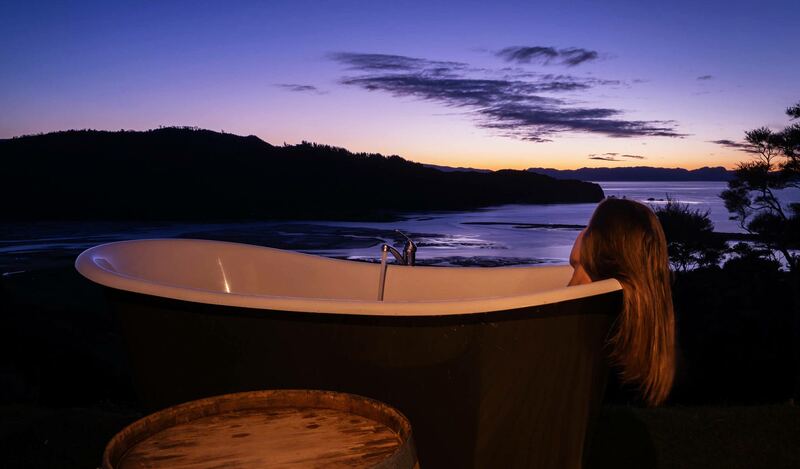 So if you’d enjoy a cosy hot bath outside, lounging under millions of stars and listening to the moreporks at night, this is the place for you. Kiwi Greenie is our new low-energy passive solar design home for everyone. It's spectacular views over Wainui Bay are ready to be enjoyed from the outdoor bath, master bedroom and open plan living and dining area. Our second generation Greenie is the next step in eco-home design - Little Greenie design and build process. Little Greenie is a serious low-energy passive solar design, demonstrating the future of sustainable house building. It's the show home of Little Greenie Design & Build. 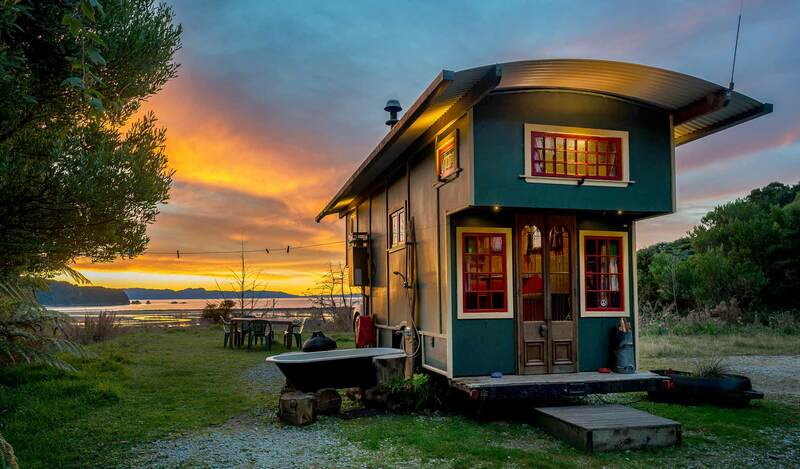 If you want to enjoy the still winter days in Golden Bay, this house catches the suns energy and stores it, this is real comfort - an experience worth living. House Truck is a lovingly restored and beautifully presented 1950's Commer. Surrounded by fantastic sea and mountain views in a private bush location. This fully equipped wagon is a cosy sanctuary to restore your pioneer spirit. This fascinating house was started 20 years ago by some of the original 'Hippies' in Golden Bay and has recently been restored and skillfully completed. It is of funky and fun design with all rooms on different levels. Which holiday home is right for me? House Truck, Tiny Greenie and Little Greenie will suit a relationship-nurture holiday retreat - especially where seclusion and peaceful surroundings are priorities. Kiwi Greenie offers an eco-retreat with total comfort for everyone (sleeps up to four), better suited for children. Tiny Greenie and House Truck sleep four in a small space with the beds on mezzanine platforms. Hippie House is suitable accommodation for families who wish to find a holiday home to let the days drift by. Sleeps up to six. If you're having difficulty finding accommodation during your time in Golden Bay then you can compare the availability calendars for all our accommodation options. You can read customer reviews on our Airbnb.com page. 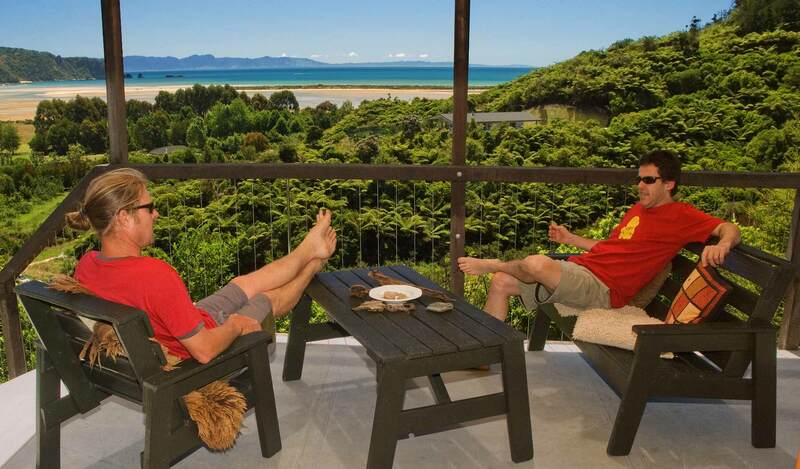 Golden Bay Hideaway is currently the only accommodation option available at the Northern end of the Abel Tasman Coastal Track. Walkers can now come right through the park to Golden Bay and not have to worry about finding transportation into Takaka. All three accommodation options are located on the same property in Wainui Bay, Golden Bay. Situated at the top of New Zealand’s South Island and adjacent to Abel Tasman National Park, Wainui Bay has a slow pace of life with an abundance of natural beauty. Many elements of New Zealand life the way it used to be, are still remaining in Wainui Bay. There’s a small family run farm, lots of native birds, no shops and people still have time to go to the beach. Just fifteen minutes drive to Pohara's cafés, shops, bars, galleries and other urban delights. 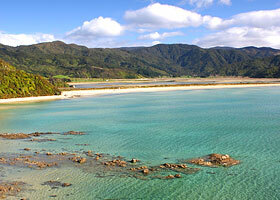 Golden Bay's main town of Takaka is 25 minutes away.